Last Friday night’s match between St. Pauli and Schalke is only the 7th in Bundesliga history to be abandoned. One individual’s action has given an entire group of fans a bad wrap. Now the FC St. Pauli have to play their next home match against Werder in front of empty terraces. Posted in Bundesliga and tagged beer throwing, FC St. Pauli, Holger Stanislawski, Millerntor. Bookmark the permalink. “Hells Bells” of Australian legends AC/DC is ringing out of the speakers, and the fans have come to see a fight. No, I am not describing the atmosphere just before a boxing match, but the way FC St. Pauli start their home games. Here is why everybody in Germany loves the FC St. Pauli. Above: St. Pauli entering the pitch. 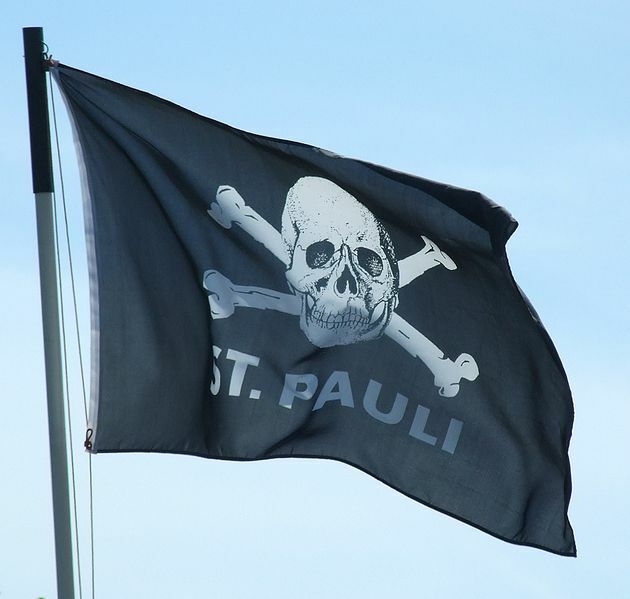 The fans of St. Pauli have made the skull and crossbones their very own and special sign. base is left leaning political. The fans of the club embrace multiculturalism, and a fan environment free of sexism or any other kind of mundane bigotry. 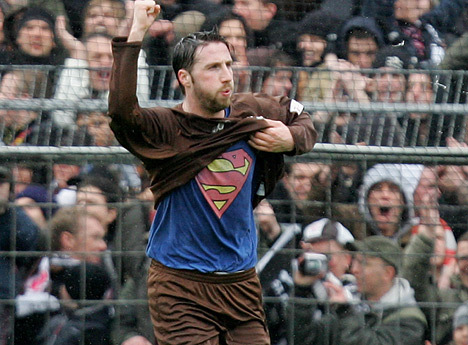 St. Pauli’s fans have always fought against those things vigorously. An example of that should be mentioned: When the German version of the magazine Maxim put up an ad-board at the Millerntor that displayed a female in a compromising position, both male and female fans of the club rallied the club to get the board removed(which it ultimately was).There is just this certain touch of rock’n’roll mentality to the club’s fans, that makes St. Pauli so appealing beyond the boarders of Hamburg. Posted in Bundesliga, Bundesliga history, Club culture, St. Pauli and tagged Deniz Naki, Fans, FC St. Pauli, Gerald Asamoah, Hamburger derby, Hamburger SV, Holger Stanislawski, Totenkopf. Bookmark the permalink.